I get asked quite often what inspires me. I think inspiration can be really hard to pin down - it's something I find everywhere. I'm going to write about a few different things that inspired me, since there are so many! Here's part one. Memories and nostalgia play important roles in my work and in keeping me motivated - they remind me why I do what I do. Often inspiration comes from the things I care about the most. Some of my very first memories are of my pets, and these memories are a constant source of inspiration to me, and for my pet portrait work. I think I'm 3 or 4 here, with my guinea pig, Bambi. I grew up surrounded by pets. From the age of about 3 to 18, we had: 2 goldfish, 2 rabbits, 2 guinea pigs, 2 dogs and 2 hamsters. Everything came in twos - one for me, one for my sister. The oldest pet we had turned out to be one of our goldfish (which came from the funfair), who lived to be 18 years old. I loved having animals in the house, and I have so many memories of them all. Our two dogs, Tess & Bo, were amazing companions to grow up with. Tess & Bo, our dogs. They came from the same litter and always had to be together, and were always touching when they were asleep. My parents got another dog, Max, after my sister and I had left home for uni. We all loved having Max around, a bundle of energy as a puppy and loving & loyal when he got older. My sister's little dog, Gus, now lives with my parents. He'll roll over for a belly rub as soon as you come in the door, then jump up for a cuddle and try to lick your face! For me, home means having animals around - there's nothing quite like it, and that special bond we have with our pets. Max & Gus together - they were the best of friends. Three years ago I was lucky enough to get my very own dog, Jeffers. He came to live with me and my partner Tim when he was 8 weeks old, and it's been life-changing to watch him grow up! He's our best friend and constant companion. I love to see his happy face first thing in the morning, going out for walks, having lots of cuddles, and hearing the patter of his paws as he wanders around the flat. He always brings me a shoe, or a sock, whenever I come home, and runs around enthusiastically wagging his tail. So pets have been, and always will be, a huge part of my life. I love them all! It's inspiring to me to see how much other people love their pets too, and it's so nice to see this in the photos I get sent for painting pet portraits. This is something I want to communicate in my pet portraits - that special bond, and the little things that make each pet unique. Pets are such a joy to have in our lives, and this is why I want to paint them! 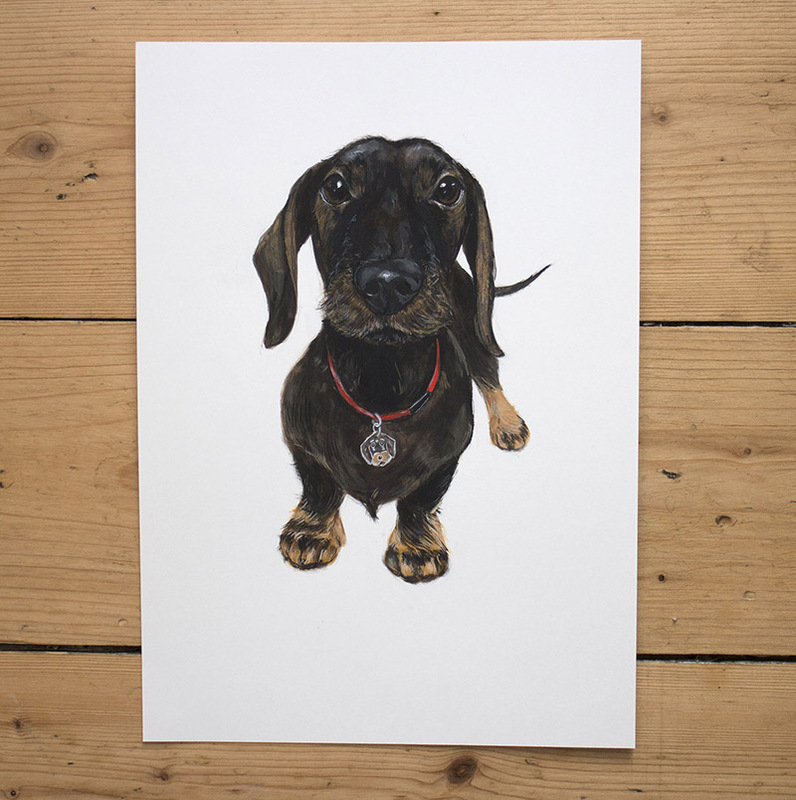 Here's a couple of my favourite recent pet portraits, of some really special dogs. This is Molly, an 11-year-old Jack Russell who is always wagging her tail. This is Filippo, who passed away not long before I painted his portrait. He was a much-loved Dachshund who lived in Italy.